Foxgloves is a superb Grade II Listed Georgian townhouse dating from the mid 18th century which was once the local Police House for over a hundred years. The property has recently undergone major renovation to a very high standard, with works including full re-wiring, oil-fired central heating, some replacement windows and renovated shutters, new kitchen and bathrooms. With generously proportioned rooms and a stunning interior offering beautifully presented accommodation over three floors, the property boasts many period features such as high ceilings, sash windows, an elegant, sweeping staircase, deep skirting's, exposed beams and fireplaces, all so typical of the Georgian era. On the ground floor is an entrance lobby, reception room/ study with wooden flooring, period glazed cupboard and sash window with shutters. The Living room with open stone fireplace, wooden flooring, sash window and shutters. Inner hall with access to beautiful period staircase, and stable door to the driveway, coat cupboard, door to utility room with stainless steel sink, plumbing for washing machine, WC and heated towel rail. Kitchen/ breakfast room with range of white fitted units incorporating a fridge/freezer, dishwasher and ceramic sink. Stone fireplace with space for range cooker or Aga. Door to snug with feature stone fireplace and sliding patio doors to the terrace and garden. The first floor comprises four double bedrooms, a family bathroom with bath and shower over, WC, basin and heated towel rail. Separate shower room with shower cubicle, basin, WC and heated towel rail. From the landing, stairs to the second floor landing with deep storage cupboard, the fifth double bedroom and the large loft/ sixth bedroom with extensive exposed beams. 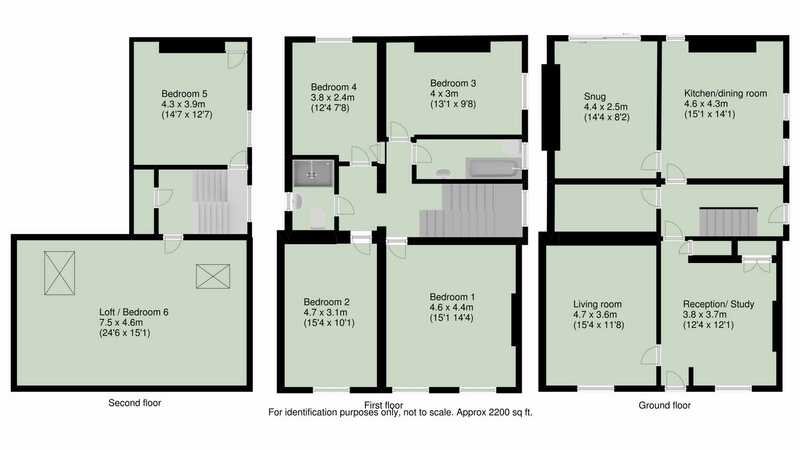 Planning permissions exist for further improvements/ alterations to the property if required and which include altering the kitchen to make a kitchen/ dining room, a master bedroom en-suite on the first floor and an en-suite to the 5th bedroom on the second floor. For further information contact the selling agent or visit . Outside the front garden laid to lawn is enclosed with attractive wrought iron railings a pedestrian gate and path to the front door. The entrance driveway to one side of the house is accessed through double gates which lead to the extensive parking area and a timber garage (which has planning permission to replace with a summer house), there is an exterior boiler and oil storage tank. The delightful walled gardens are a particular feature of the property, being south facing and secluded with an area of orchard and a raised patio area with views over Bampton and the hills beyond. Immediately to the rear of the property, leading off the snug, is a private, stone paved terrace, ideal for al-fresco dining with one wall remaining from part of the old lock up when it was the Police House. Foxgloves is situated in the centre of Bampton, a charming, historic village with many amenities which include popular pubs and restaurants, butcher, baker, greengrocer, chemist, doctor's practice, primary school, post office and a lovely 15th century church. The larger market town of Tiverton lies 7 miles to the south with a wide range of facilities including the well regarded Blundell's School. From Tiverton, there is fast dual carriage way access to Junction 27 of the M5 motorway and Tiverton Parkway mainline station which provides regular intercity services to London (Paddington 2 hours). The whole area is well known for its outstanding natural beauty with Exmoor National Park just 3.5 miles to the north and the beaches of the beautiful North Devon coast are only a 40 minute drive away. 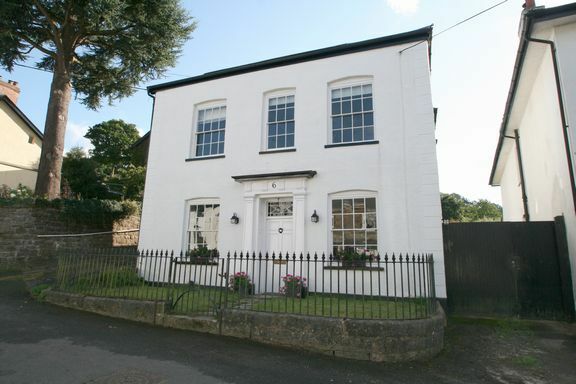 Property descriptions and related information displayed on this page, with the exclusion of Running Costs data, are marketing materials provided by Seddons - Bampton, and do not constitute property particulars. Please contact Seddons - Bampton for full details and further information. The Running Costs data displayed on this page are provided by PrimeLocation to give an indication of potential running costs based on various data sources. PrimeLocation does not warrant or accept any responsibility for the accuracy or completeness of the property descriptions, related information or Running Costs data provided here.